Like most pen knives, this model has a longer 2-inch clip point blade and a smaller pen blade. Both are made from stainless steel blades. Coming in at 2.75 inches when closed, the knife features handsome genuine stag handles with nickel silver bolsters, brass liners, and an inlayed medallion of the iconic Boker tree logo. Made in Solingen, Germany, it’s tough to be the quality and history of such an iconic pattern. 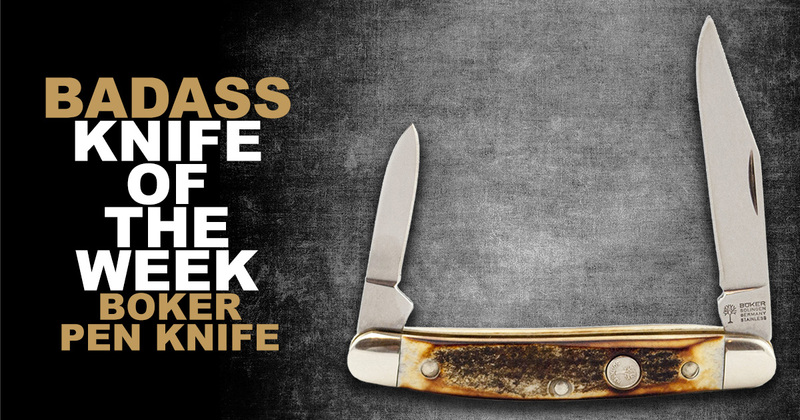 For more info on this Badass Knife of the Week, see the product page for the Boker Pen Knife. Boker Pen Knife is really interesting , please share it. The pen knife is such a great knife. The size of this pen knife is also perfect. i request to share you all.